10 Memorable Ways to Enjoy "Summertime in Northern Michigan"
I have to admit I’ve never been much of a Kid Rock fan, but listening to his catchy 2008 hit All Summer Long while sipping beer and motoring on a top-of-the-line pontoon boat along the Indian River between Burt and Mullet lakes in Northern Michigan was a perfect way to spend a hot July afternoon. And as I discovered on this recent visit, there's plenty to keep any couple or family awed, entertained, and active. This lake-studded region has been a favorite summer playground of city dwellers from Detroit, Chicago, and other Midwest metro areas since the Victorian era – meaning there’s lots of fascinating history (such as the storied Grand Hotel, shown at left) mixed in with modern fun and games. Here are 10 ways to rock this land of Great Lakes, sweet cherries, flavorful whitefish, and efficient ferries. 1. Get to know the local wildlife. 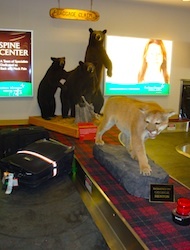 I’ve been in a lot of airports, but never have I had a prowling mountain lion and three black bears stare at me at baggage claim. Ok, so they’re stuffed, but the welcome committee at Pellston Regional Airport (the gateway to Mackinac Island, Petoskey, and other lakeside retreats) makes for a great photo op as you wait for your bags. And yes, they were area residents when still alive, but unless you’re a hunter you’re more apt to see deer, rabbits, ducks, eagles, and other winged critters than these bad boys. 2. Have a “Grand” old time. When you first see it from a Shepler’s ferry as you cross the Straits of Mackinac, the Grand Hotel is a brilliant white blur against a low-slung green “turtle shell” of an island, which is what the local Native American tribes thought it looked like and why they named it Mackinac. But as the ferry sloshes closer and the massive hotel comes into focus, you realize you are in for something special. And as you arrive in a ritzy carriage pulled by two giant dappled Percheron stallions, amid rows of 2,500 bright red geraniums and beneath a regiment of fluttering U.S. flags, the effect is overwhelming, like seeing Disney World for the first time as a kid. Celebrating its 125th birthday this year (it was built in a mind-blowing 93 days in 1887 for about $250,000), this now 385-room hotel has the world’s longest front porch (660 feet) and distinctively vibrant decor (its rooms are all individually designed and feature 220 paint colors and 264 different wallpapers). 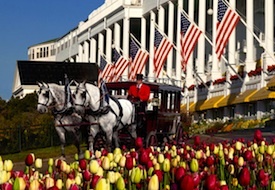 Not to miss: a history talk by the hotel’s encyclopedic-yet-entertaining historian Bob Tagatz – one highlight among many is his side-splitting story about the hotel’s Victorian-era “dog races;” afternoon tea ($25 per person) in the Salon – tea, finger sandwiches, scones, chocolates, and pink champagne; a cocktail in the Cupula Bar with its 180-degree views; dinner at Woods, a lavishly decorated cottage that’s one of seven dining venues; and the hotel’s decadent signature Grand Pecan Ball dessert – think hot fudge sundae but even better (more than 50,000 are served each season). The Grand Hotel is open until October 31 and room rates start at $254 per person, per night, including breakfast, lunch, and five-course dinner. 3. Bike it or hoof it. Pedal power and horsepower (the non-motorized kind) are the only ways to get around car-free Mackinac Island. In season (from late April to late October), 600 horses call the island home and spend their days and nights providing taxi service. But you can also horseback ride on 40 miles of bridle paths or rent a horse and carriage and explore on your own (from $64 per hour, available from Jacks Livery Stable). There are easily thousands of bikes on Mackinac and renting one ($8 per hour/$30 per half day from the Grand Hotel’s Tennis Shop) is the easiest way to get some exercise while exploring downtown (just don’t get distracted by the 18 fudge shops!). Better yet, circle the island’s scenic, eight-mile perimeter to enjoy views of postcard-perfect Victorian homes and panoramic Lake Huron vistas – it’s about a 90-minute pedal and well worth it. 4. Visit a fort with a view. I’m not usually a fan of forts, but well-preserved Fort Mackinac (admission: $11, $6.50 for kids) is pretty darn fascinating. 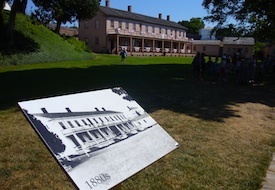 Even if you’re not traveling with kids, hike up the stairs from downtown or hop a horse-drawn taxi to this circa-1780 military outpost where costumed “soldiers” fire cannons hourly and barracks, officers’ quarters, and a hospital are filled with amazing artifacts of the era. The cannon fire will remind you that this was where the War of 1812 began (as the British slipped across the water from Canada), while more civilized pursuits are found in the Tea Room (a Grand Hotel restaurant), where you can enjoy a casual lunch and the island’s most impressive view. 5. Find Hemingway’s haunts. Fans of Ernest Hemingway should base themselves in Petoskey (Stafford’s Perry Hotel, an atmospheric 1899 brick historic hotel downtown makes a great base; rates start at $259/night, including breakfast), where you can use a "Tour Hemingway’s Michigan" guide to check out spots he frequented (every summer from his birth until 1921) such as Jesperson’s Restaurant, McCarthy’s Barber Shop, the Pere Marquette Railway Station, and the Perry Hotel. 6. Boat, kayak, or golf till you drop. If you’re an experienced boater, you should definitely rent a 23-foot, 11-person Tahoe pontoon boat from Indian River Sports ($250 a day). Crank up the Kid Rock as you begin your day on the waters of Mullet Lake, cruise through the cattail-lined shallows of Indian River, and emerge onto crystal-clear Burt Lake for a refreshing swim. 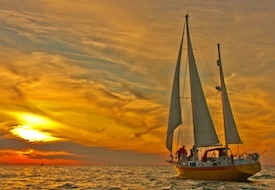 If you prefer to leave the driving to someone else, hop on board Charlevoix-based Sunshine Charters’ 40-foot catamaran for a sunset sail ($40 per person) on a trio of lakes: million-dollar-cottage-lined Round Lake, scenic Lake Charlevoix, and expansive Lake Michigan, where the sunsets can be pretty spectacular. If kayaks are more your thing, rent them (from $38 per person per hour, two-hour minimum) from The Outfitter in Harbor Springs or book a two-hour Harbor Tour ($60 per person). Like lakes, golf courses are plentiful in Northern Michigan (there’s one on Mackinac Island and more than 14 in the Petoskey area alone), so you can play a different course every day. 7. Stroll Petoskey and Harbor Springs. Looking like a mid-century film set (there’s even a retro-looking JC Penney), Petoskey is a lakeside town of 7,000 that’s a great place to stroll as you shop for everything from t-shirts and amusing souvenirs to high-quality leather and artwork. 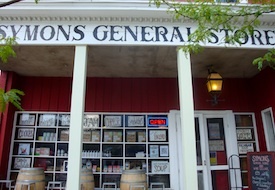 Be sure to stop by Grandpa Shorter’s, Symons General Store, and assorted galleries such as the Ward & Eis Gallery for Native American-inspired leather goods, jewelry, and art. In Harbor Springs, check out the unusual “Frogman” bronze sculptures by artist Tim Cotterill in R Frogs Gallery, the striking silver and gemstone jewelry (including local Petoskey stones) at Becky Thatcher Designs, and the fun and affordable jewelry and hand-rolled cigars at Julieta y Romeo. 8. Savor local flavors. 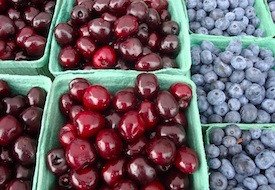 You will eat well in Northern Michigan, thanks to a bounty of fresh produce and a few delicious regional specialties. Don’t miss: the crumb-topped ABC (Apple-Blueberry-Cherry) pie at Grand Traverse Pie Company in Petoskey; the chocolate turtles, fudge, and ice cream at Kilwins in Petoskey or Charlevoix; the morel bisque and cherry berry bibb salad (and almost everything else on the menu) at Stafford’s Pier Restaurant in Harbor Springs; the John Cross smoked salmon dip, chopped spinach-barley salad, and stone-fired Margherita pizza at Pallette Bistro in Petoskey; and the all-you-can-eat $19.95 per person Sunday Brunch at Stafford’s Bay View Inn in Petoskey (it’s been served for 51 years), where the chilled raspberry soup, eggs Benedict, salmon du jour, smoked whitefish, and dessert treats are standouts. 9. Wine taste with a twist. 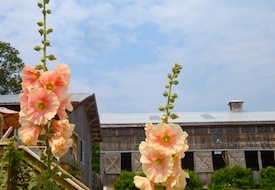 There are wineries aplenty about an hour’s drive south in and around Traverse City, but you can also have an enjoyable afternoon of sipping not far from Petoskey at the laid-back Harbor Springs Vineyards & Winery at Pond Hill Farm. You can enjoy four tastes of wine or cider for $5 (the Reisling, Chardonnay, and Peach Cider where my favorites) and then cavort among the farm’s pigs and sheep as you test your skill at firing the “Squash Rocket,” a gigantic slingshot that you load with gourds and potatoes and fire onto the vacant field (the veggies will later be gobbled up by the grazing animals). 10. Admire the architecture. 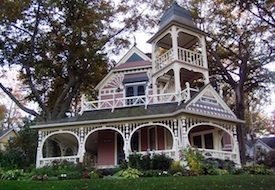 Mackinac Island isn’t the only spot dotted with elegant 19th-century architecture. 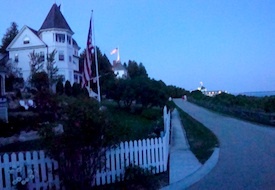 Get in your car and cruise Bay View, a summer “cottage” community of stately Victorian homes established in 1875 and designated a National Historical Landmark 25 years ago. Then head to Harbor Springs, where grand and immaculately kept Lake Michigan waterfront homes line the Harbor Point and Wequetonsing neighborhoods. Finally, check out the streets and shoreline around Round Lake in Charlevoix, where more than two-dozen quirky “mushroom” homes designed by Earl A. Young in the early 20th century look like something a hobbit would own, but some fetch millions of dollars. Use our Travel Search price comparison tool to find the lowest rate on flights, hotels, cruises, and more travel deals.